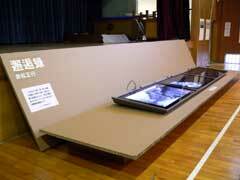 The exhibition venue was the gymnasium of a defunct primary school. A time line appears when the audience approaches the work. Move left or right to select the year. Move up or down to change the display. When the audience member moves often, various pictures emerge. Pictures which the audience paid close attention to become enlarged. Various pictures appear and disappear. 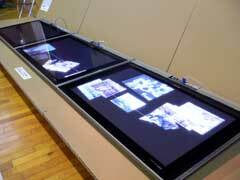 There were also photo-panels exhibited. 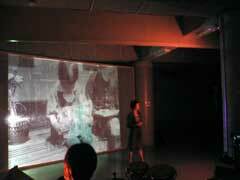 An improvisational performance with photographs displayed in the background. 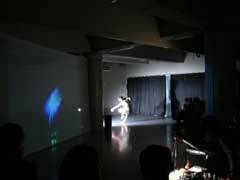 Dance, percussion performance, and film screening. Reconstruction of time through video camera. 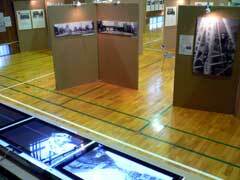 KAIKOUROKU is a display of approximately 1,000 historical photographs. The audience moves their own bodies to manipulate the year and number of photos displayed, as they watch the photographs float up from the darkness and flutter back down. This work was displayed in the Third Story of Me and Town Exhibition, and used a wide variety of photographs taken between the early Meiji Period and the present, which were donated by local residents. Through the photographs, people encounter times past, and the history and community in the urbanizing region emerges into the scene interwoven with various events that exceed time. In addition, improvisational video, dance, and musical performances using these pictures and video cameras were also featured at the exhibition. 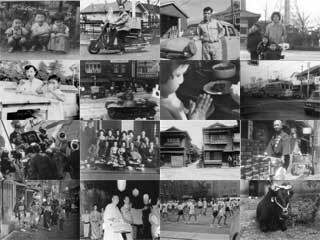 The photographs used in KAIKOUROKU were donated by people from Akasaka, Aoyama, Shinbashi, Azabu and elsewhere who had lived there from long before, and the photographs themselves were snapshots and commemorative photos taken not by professionals, but by common citizens. The photographs, which numbered approximately 1,000, were categorized by year, and ranged from 1877 (Meiji 10) to 2003 (Heisei 15), extending 127 years. These photographs were scanned into a computer, and after color corrections and trimming, entered into a database with photo date, photo location, and photographer (or owner of photograph). Also included in the database are the comments by the owners of the photographs, which were not used in the exhibition. 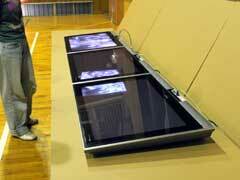 Three 50-inch plasma displays aligned horizontally were used to display KAIKOUROKU. 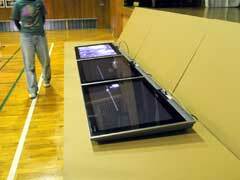 The plasma displays had a resolution of 1,366 pixels wide by 768 pixels tall, so with three displays, there was a broad display area of 4,098 by 768 pixels. A computer analyzes the audienceÅfs movements through video taken from a video camera hidden by curtains behind the displays. 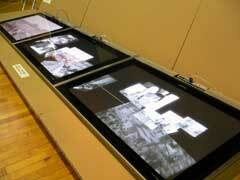 The year displayed, and how the photographs are displayed is determined according to the audienceÅfs movements. The photographs are retrieved from the image database and placed in three-dimensional space, gradually changing while moving through space. From the audienceÅfs point of view, a white timeline appears as they approach the display, and the photographs emerge to the left or right according to the audienceÅfs positions. The photographs rotate languidly while approaching the audience, and finally float off toward the perimeter. The number of photographs displayed and the way in which they move is also determined by the audienceÅfs up, down, forward, and backward movements. Therefore, the audience can have various photographs emerge like a shower of blossoms, or can choose to study one picture, according to their movements. When I created KAIKOUROKU, I had first the 1,000 or so photographs donated by the local residents, so it was just a matter of how to present them to the audience. Although you canÅft say that 1,000 is a massive number, a great deal of effort would be required to view them one by one. So with this project, my goal was to make a kind of browser that would enable an effective way to process and view a large number of photographs. This pertains the problem in recent years, for both individuals and society, of how to manage and present to the user the various image and audio data that is continually increasing. However, the target for this work was photographs collected for a specific reason, and being able to view the photographs lightheartedly with ease was more important than performing a functional high-level search. For this reason the 1,000 photographs were categorized by year, with each photograph equal in value to all other photographs within the same year. 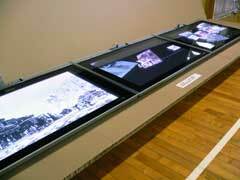 Therefore, the audience was conscious of viewing the photographs only by year, which made the operations simpler. Further, differences in people and landscapes were made clear, and it became possible for the viewer to intuitively grasp the historical trends and social transitions. 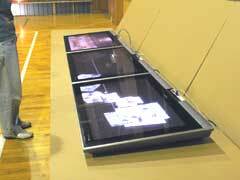 The actual operation was based on the audienceÅfs movements according to the video camera imaging analysis. In short, the audience manipulated the work through actions like approaching the work, walking in front of the work, standing, moving their hands, and squatting. On the screen, a horizontal timeline is displayed with a small indicator and numbers showing the years of the photographs. The indicator moves left to right according to the audienceÅfs movements, and from that position photographs corresponding to that year emerge. Large movements up, down, left or right increases the number of photographs that appear. Further, the audience can choose to view not just one year, but also a number of different years by moving swiftly. Through this type of system, the audience can operate the work with a natural feel, and while maintaining a sense of unity with the work, they can follow the timeline and retrieve various photographs. In this sense, what the work creates is a KAIKOU, or encounter, between the audience and the photographs: an encounter between one age and another. Through these various KAIKOU, the audience witness scenes where the photographs are interwoven, and within the background they can find a story that unfolds. The third exhibition "The story of Me and Town"